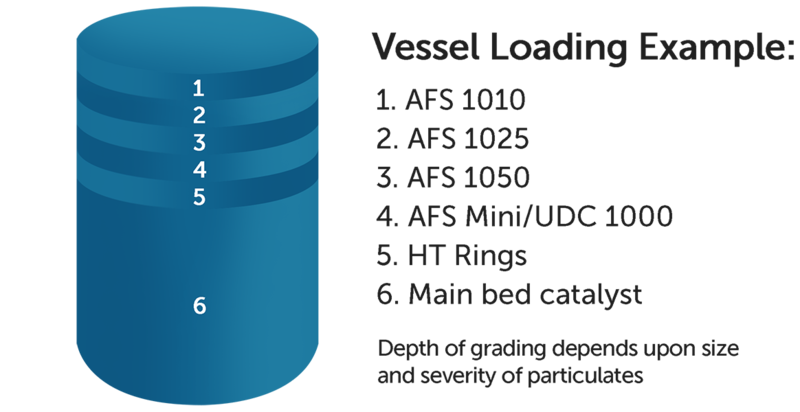 A unique aspect of UNICAT’s bed design technology is its proprietary AFS (active filtration system) bed protection filter disk grading technology. This technology is used to filter fines in hydrotreating units, sulfur guard beds and chloride guard beds. Any solid specimen that may cause premature EOR pressure drop conditions can be filtered. UNICAT’s proven and patented technology significantly increases lifetimes of pressure sensitive units, up to 200%. UNICAT’s bed design technology is its proprietary AFS (active filtration system) bed protection filter disk grading technology. Active Catalyst for maximum Si, As, Ni and V Removal with ultra high surface area and pore volume. UNICAT has developed the most comprehensive active ring product offerings for Si, Ni, V, As Removal and Olefin saturation. All CGS rings are available in four sizes. HT series for Naphtha, Kerosene and light duty Hydro processing applications.